I spend time chatting in the local forums, and have been stalked for three years there by Winston, currently appearing as Futureshock. Two local attorneys have taken on, pro bono, the case of a couple who have accumulated over 60 citations, almost exclusively for sleeping. The attorneys are Jonathan Gettleman and Mark Briscoe. One of the prosecuting attorneys is City Attorney Susan Barisone, the wife of the City Attorney John Barisone. John Barisone has the distinction of gutting Proposition K.
As We See It: Downtown laws take precedence: Rights of homeless couple clash with public’s rights. And two more pages of “As You See It” letters to the editor. One thing I’ve been interested in (a newcomer to this debate to some degree) is the whole idea that the city council owns public space and that they can, basically, privatize what is otherwise owned by the public in general. Not because you pay taxes, necessarily, but because you exist and take up space and are a citizen. And for a board of a very few people to say that we are going to dictate how people who aren’t hurting anyone can or can’t use the commons, especially when it comes to throwing people in jail, is kind of shocking. It defies the basic principles which were set forth by our founding fathers. I was able to observe Briscoe in court during my numerous hearings and have a nodding acquaintance with him. He strikes me as a good guy fighting the good fight. I will be watching this with a great deal of interest. In one of the topix threads about this (attached to the online articles in the Sentinel) Winston/Futureshock brought up the Pizza My Heart incident. For the umpteenth time. I have mentioned this person before. 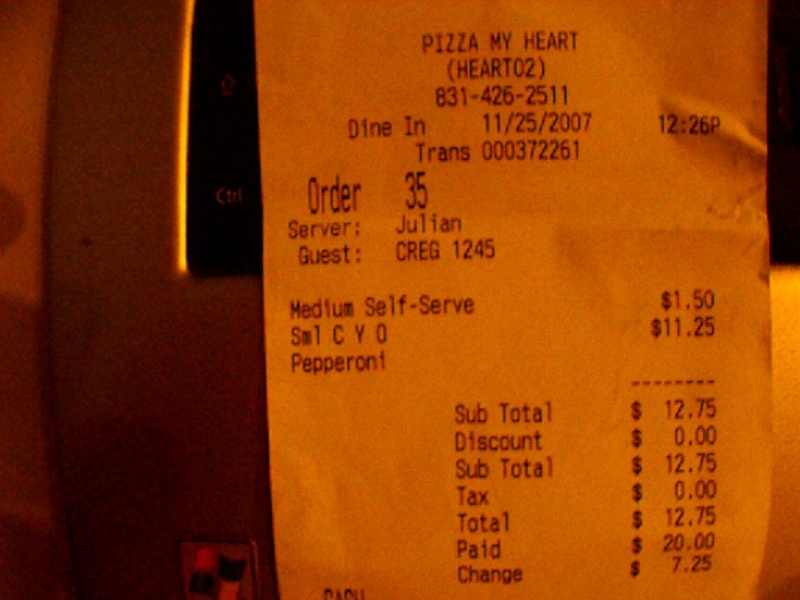 You could have bought a whole pizza with a $20. Did you buy some ‘medicine’? if you had been a cash customer. Did they wind up keeping your stash? I’ll bet they flushed it down the toilet. I was just downtown on the motorcycle. Did you notice the yellow Ducati 748? a block down from Cinema 9. A good day to be alive! I need to put that image with the appropriate blog entry, and what with all I’ve been through (and I wasn’t well to begin with) I’d forgotten about it until you reminded me. It was important to me because of the time-stamp. 12:26pm. Takes them 20 minutes to make a pizza, so I got it about 12:46pm. And I did get a medium. So I sat there for an hour while I ate it and did some things on the internet, the last being posting a message in the Sentinel Forums at 1:48pm. And then I packed up the laptop, and the cord, and everything else, and asked for a token, and went to the restroom. And the police were called, according to the police report, at 1:52pm; as soon as I got in the bathroom. When I saw the thread on the Sentinel Forums had been deleted (with the -critical- time stamp) I emailed them and asked for them to restore it and why it was important. Or to at least send me a copy. I never heard from them. I was amazed the thread had been deleted in the first place. I’d made quite a big deal about it, and there was quite a big discussion about the timeline. You should know, you were there. But then they made you, who had already “exposed” Karen, and even sent emails to her employer from what I hear; they made you a moderator of the forum with the ability to edit my posts without leaving a trace. Which you did. So, no, I don’t go out now unless absolutely necessary. As for the rest, I have every confidence you could keep me busy day and night for the rest of my life debunking your lies and defending myself against your character assasination. And I’d rather not do that. And, besides, it seems to me you’ve proven – by your own words – everything I’ve ever said or hinted about you and worse. At least you have to those with eyes to see and ears to hear. So, how much did you pay Eby? I’d just like to add here that once I got out of jail and got a lawyer the first thing I asked for was the security video, knowing it would exonerate me. Well, what do you know, Pizza My Heart didn’t have it. My guess is they didn’t have it because the police wouldn’t have a case and I would have one hell of a civil suit if the jury got to see that security video. And the people who accused and arrested me would be guilty of criminal false witness and false arrest charges. I know if I were a business owner and an incident such as this happened in my establishment I not only would save the tape, but make copies and put them in a safe. It seems to me if I had money I could force this Winston/FutureShock/Dan Waldrop to reveal himself and get a restraining order against him. What he is doing to me is no different than making repeated anonymous harassing and threatening phone calls. And he knows it. And he enjoys it.